Produktinformationen "Korean Anthropology: Contemporary Korean Culture in Flux"
Korean anthropology holds a unique position in the field of anthropology, having first developed with native scholars studying native culture under the prevalent influence of cultural and social anthropology, rather than with the past western practice of studying the Other. Since the 1980s, several attempts have been made to examine Korean culture from different points of view, such as political economy and area studies. This trend is visible in the articles contributed to the Korea Journal over the past forty years. While the early articles focus mainly on Korean shamanism and folklore, the emphasis shifts in the latter half to more diverse subjects such as Koreans abroad and changes in Korean communities under the social, economic, and political influences of the modern times. 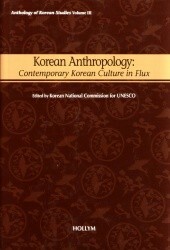 This volume, Korean Anthropology: Contemporary Korean Culture in Flux, presents 30 original articles carefully selected from the Korea Journal covering all aspects of Korean culture seen through the distinct viewpoints of anthropologists, sociologists, psychologists, geographers, architects, folklorists, and psychiatrists. The articles, chosen under the guidance of Professor Han Kyung-Koo, are arranged along five major themes. Articles in Part I discuss different ways of understanding Korean culture including traditional conceptualization and utilization of nature and living space, and representations abroad. Part II looks at the changes and continuities in Korean communities and beliefs under the social and political influences of modern Korea, ranging from Saemaeul Movement, religious conflicts, and marriage customs. Part III focuses on Korean women in ""patriarchal"" Korean society and the male-female relationship in contemporary Korea. Among featured subjects are women on Jeju-do island, female workers in multinational corporations, and family relations. Shamanistic rituals and fortunetelling, the main theme of Part IV, are still prevalent in Korea alongside modern medicine and cutting-edge technology despite the conflicts and confusion brought on by the rapid industrialization and westernization of Korean society. While some traditions have been discarded, other have been retained in a diff! erent or compromised form, This brings us to the final Part V which explores how various social relationships are formed and maintained within modern Korean society: men and women continue to rely on kinship and social ties to survive in a highly competitive and centralized society. Intended to be an introductory yet comprehensive collection of readings on Korean culture, we hope this volume will stimulate further debates and discussions on Korean culture and society. " V. Too Modern Too Soon? · Lee, Jaehyuck. Society in a Vortex? Weiterführende Links zu "Korean Anthropology: Contemporary Korean Culture in Flux"
Kundenbewertungen für "Korean Anthropology: Contemporary Korean Culture in Flux"